House sits on a nearly 3/4 acre lot & 3 adjoining lots are also for sale separately which would be 2.36 acres (total for 4 lots–see attached). Home currently rented month-to-month to tenants but highest & best use is likely as commercial once rezoned (apartments/condos/??) or reconfigure house as a business office. All lots are level and ideal for construction or parking. Property has utilities. FEW options left in area for vacant land–grab this one today! AVM=$795k. 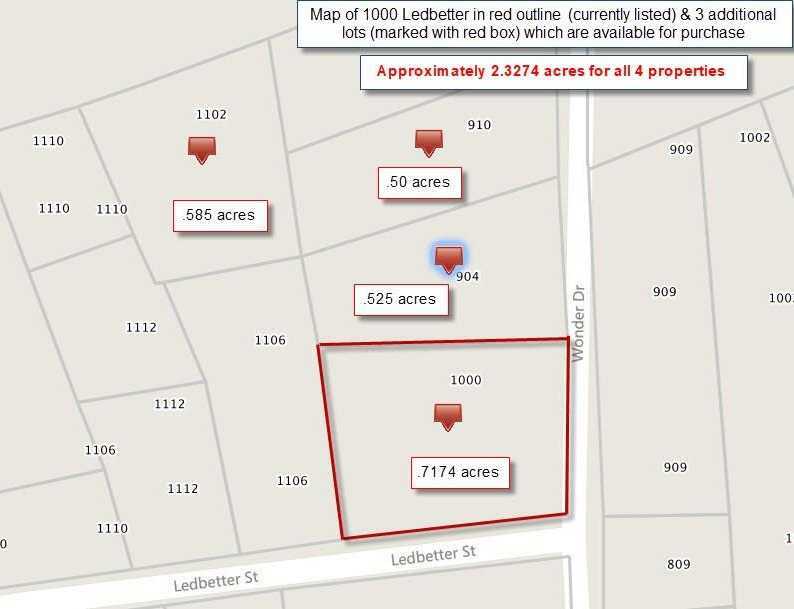 Please, send me more information on this property: MLS# 4717115 – $685,000 – 1000 Ledbetter St, Round Rock, TX 78681. I would like to schedule a private showing for this property: MLS# 4717115 – $685,000 – 1000 Ledbetter St, Round Rock, TX 78681.